Driven by her passion for aesthetics, self-exploration and psychology, Claudia has been both the student and pioneer of her art for over two decades. In 1994 she graduated as an architect from The University of Los Andes, in Bogota, Colombia and as part of the program studied at The Heriot Watt University in Scotland. Fascinated about the history of Architecture and eager to explore new ways of expression, Claudia found herself in Florence, Italy studying the exquisite techniques behind great Renaissance art and design. Upon returning from Florence she was ready to unlearn everything she had studied to make way for a new and uninhibited approach to creating art. For the next eight years, Claudia participated in an Abstract Expressionism workshop where she challenged the traditional rules. Here, the former furniture designer learned to relinquish control, abandon aesthetics and let her own language as an artist emerge. A language with the ability to directly access various parts of the body and parts of consciousness that the ego often speaks over. During this eight year span, Claudia painted only in black and white, not giving into the temptation of color, which sparks the impulse to control and anticipate the outcome. Her language as an artist became clear. In 2003 Claudia moved to Los Angeles, opened her studio and established herself as an artist. Intrigued by both the human behavior and mind she graduated with a Masters in the Arts of Spiritual Psychology with an emphasis in Consciousness Health and Healing at The University of Santa Monica in 2014. This is where the Gestural Art Project started, a study based on combining the practices of both Spiritual Psychology and Art. Claudia continued to grow and expand her practice by graduating as a Soul Centered Professional Coach from The University of Santa Monica in 2015, where she created and developed ArThrough, an experiment that provides an open space to share, coach, heal, express and take risks through Art. Today, all of Claudia’s intuitive paintings are created using a symbolic action-based expression she calls Gestural, based on automatic painting, drawing with the nondominant hand and blindfolded which allows her to access nonverbal language and imprint soul-centered wisdom into her work. Over the course of our lives, we inherit stories, thoughts, and patterns that become part of us, but they don’t belong to us. 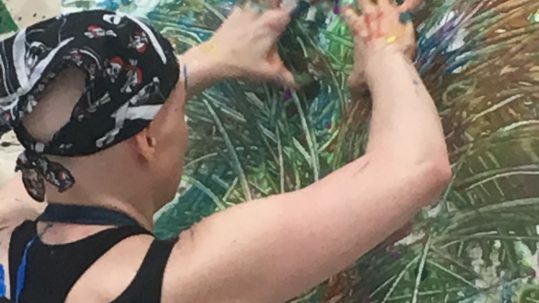 As an artist, Claudia has made it her mission to expand and challenge the status quo of what we believe about our personal experiences and limitations through creative expression. Through her own artistic approach and as part of her autobiographical book Gestural Art, Claudia created “Conversations with my Body”, a process of accessing memories stored at the level of the cell. 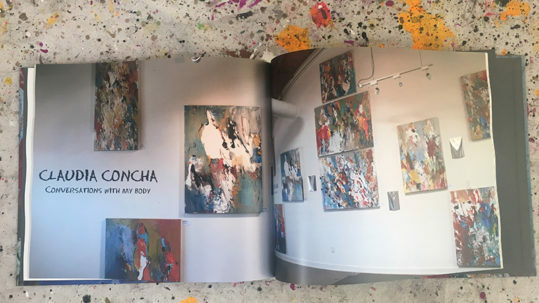 A series of thirteen paintings, each one representing and giving a voice to a different part of her body, an intimate look at the emotional wounds that can be artistically expressed and healed without a single word. “The sorrow that has no vent in tears makes other organs weep.” – Henry Maudsley, 19th century,English Anatomist.